I love sampler quilts! I love scrappy quilts, too! If you agree, you’ll enjoy making the Heartland Heritage Sampler quilt for yourself as well. Just choose fabrics and scraps from 6 colors and start sewing. The assortment of 12 inch blocks feature easy modern piecing techniques, and the pattern has step-by-step instructions with loads of graphics to guide you. 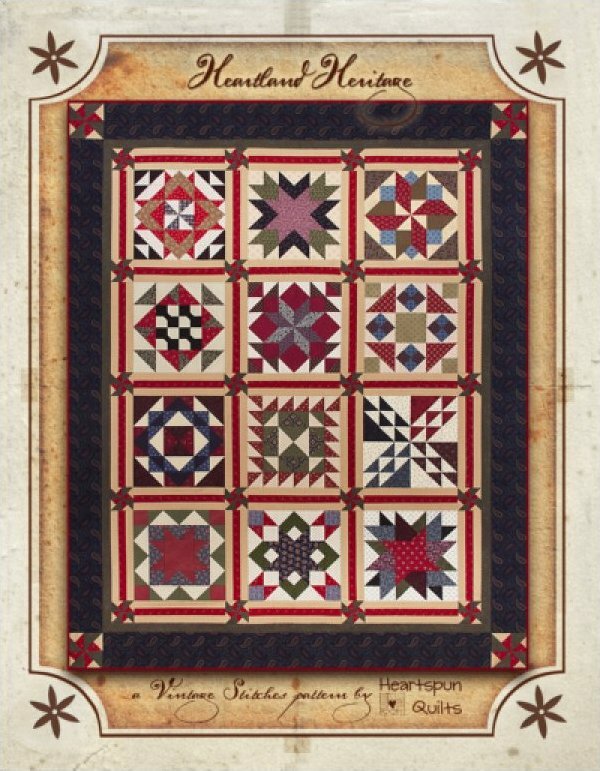 The two sides of the pattern cover show the two different versions of the quilt…one made with Kansas Troubles fabrics and the other with Civil War reproduction fabrics. You can see how the same 6 colors made two different quilts! Dig into your stash and enjoy! Quilt size: 60 1/2" x 75 1/2"
If you are ordering outside of the US, please email me and I will send you a PayPal invoice for the pattern and appropriate postage. Please note that all pattern sales are final.